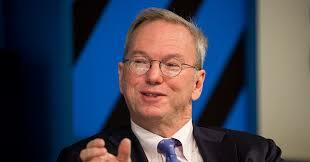 Billionaire Eric Schmidt, the former chairman of Google, is a budding bitcoin and blockchain enthusiast who said ethereum could be a "powerful platform" whose untapped potential is off-the-charts. In the wide-ranging conversation, Schmidt discussed the future of technology, corporate governance reform, Google's hiring practices, and bifurcation of the internet. When asked whether he thought blockchain was overrated or underrated, Schmidt gave a compound answer. "In the public format, overrated. In its technical use, underrated," he said (video below). "Today, blockchain is a great platform for bitcoin and other currencies. And it's a great platform for private banking transactions where people don't trust each other."